Esteysi "Stacy" Sanchez appears at a preliminary hearing on Dec. 12, 2016. 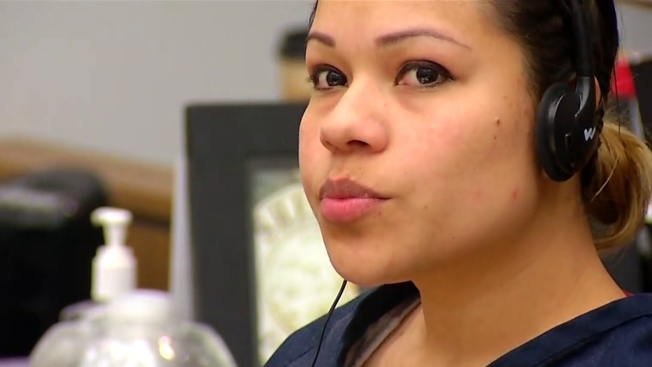 A San Diego judge has ordered a murder trial for a woman who prosecutors say struck and killed a man, then drove for a mile with his body lodged in the car. The judge on Wednesday ruled there was enough evidence to try Esteysi "Stacy" Sanchez of Oceanside for second-degree murder and other charges. The 30-year-old was arrested after Oceanside Police said her car struck and killed a man on a sidewalk. The crash occurred on June 27 along Mission Avenue east of El Camino Real and north of State Route 56. Jack Tenhulzen, 69, went through the windshield and ended up on the front passenger seat but his severed leg crashed through the back window and landed on the trunk, police said. Esteysi "Stacy" Sanchez faces criminal charges in the June 2016 crash on a sidewalk along Mission Avenue in Oceanside. NBC 7’s Astrid Solorzano reports. The force of the crash stripped Tenhulzen of his clothes, prosecutors said. Police say Sanchez drove about a mile, parked and walked away. Officers found Sanchez at her house, approximately two blocks from where she left the car. Witnesses said Sanchez had been drinking before the crash. Two hours after the crash, prosecutors said Sanchez had a blood alcohol level of 0.18-0.19, more than double the legal limit. Sanchez has pleaded not guilty to a number of charges including a murder charge, in addition to several felonies, including gross vehicular manslaughter while intoxicated, hit and run, driving under the influence of alcohol causing injury, driving with a measurable blood alcohol causing injury and a misdemeanor count of driving without a license. A prosecutor called the case an "Extreme indifference to human life." NBC 7's Rory Devine has more. The Los Angeles Times reports Sanchez was ordered back to court Jan. 11. She faces more than 15 years in prison if convicted.